In The Master Speaks, Goldsmith also lays out the differences between traditional metaphysics and The Infinite Way message, and he gives extensive practical advice on many aspects of the healing ministry for those who find themselves led to it. He offers the idea – astonishing to some – that “Everyone on earth has, potentially, the same consciousness as Jesus Christ. The question is: are we willing to put in the hours of devotion; are we willing to make the effort required to train ourselves to be conscious of the presence of God, instead of seeking some form in which God is to appear? There is the whole secret. It is up to us! If we can rely wholly on the Principle, on Consciousness, we can attain the consciousness of the Christ.” For those who are drawn to that quest, The Master Speaks is a substantial first step on the journey. 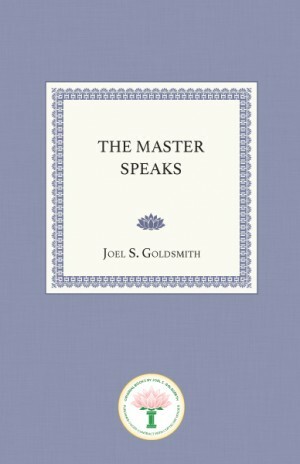 The Master Speaks is based on manuscripts from early classes in Los Angeles and San Francisco, and there are no recordings for these classes.